With the spoonbass - this instrument was in the Netherlands en Flandern in the beginning of last age very popular. May I introduce myself? My name is Eduard Bekker (46). My profession is editor at a daily newspaper and I live in The Hague, in The Netherlands. Ever since my student day’s at Wageningen (1972-1977) I have been a lover of Western folkmusic. The diatonic accordion or the melodeon as its sometimes-called in England or the French melodeon which has one row of buttons on the right hand side and is often used in Cajun music from South-West Louisiana fascinate me enormously. My dear son (almost 2 years old) testing the Hero in The South of France. At the Easter market in The Hague in 1995 I discovered a toy diatonic accordion for only 35 Guilders. It was made in China. For such a low price I couldn’t resist and bought the thing. Every day I practiced for 10 minutes whilst watching over my small son while he was having his daily bath. The results were fascinating. I even got invited by the owner of a terrace bar to come and play for an afternoon. He even paid me for it. All this on a toy I bought for 35 Guilders. At work we had an Internet terminal installed at that time. Being curious about who else might be interested in the diatonic accordion, I typed the word ‘ trekzak’ (melodeon) in a search engine. This led me to the page of the Diatonic Quarterly, which is a part of the Dutch Association of Folk Music. traditions coming together to share their music. ‘Trek er es uut’ is the ultimate event around the diatonic accordion in The Netherlands. It’s almost like a family reunion with many really nice family members. This is how I met many lovers of the instrument so dear to us. Without exception nice and helpful people who have enhanced my love for the instrument. More than that.,the diatonic accordion has changed my life somewhat. Who would have thought that I would be playing on squares and streets entertaining the public with my diatonic accordion! But once you get started it is addictive. If you would like to learn more I have written an article in the Diatonic Quarterly about this. Because of this experience I have taken a different view to life itself although it seems to fit within my ‘ life philosophy’. My life’s conviction began to cause conflict with my colleagues at work. After a while it caused such aggression that I couldn’t do anything else but quit. Because inactivity is not part of my belief system I decided to use my creativity in another way. Around this time I had made a sheet of information about the diatonic accordion for the event of an open session in a cafe in The Hague. This cafe is called ‘ De Posthoorn’. This sheet became a web page. I got so many enthusiastic reactions, that I started to build on this theme. This page still exists although the form is different. Because this site was such a success I decided to make web page building my profession. I started to get orders from my sympathetic friends in the diatonic circuit. 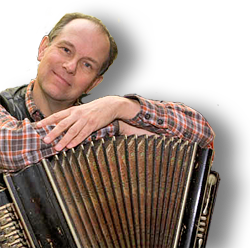 In this fashion I have built sites for Frans van der Aa (a diatonic accordion builder), the Accordion museum in Malden The Netherlands and the Association of Folk Music in The Netherlands. At present I am working on a project for the Folk Music Group ‘Madlot’ from Wageningen in The Netherlands. 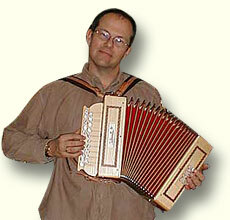 Another site for the diatonic accordion builder, Karel van der Leeuw will follow soon. Content with the Saltarelle ‘Berry’ in G/C, which disappeared when forgotten in a streetcar. 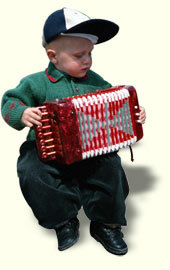 As for now I have given my Chinese ‘ Hero ‘ toy accordion to my son. The Hohner Blackbox from the picture at the top and a Hohner Pokerwork in A/D belongs now to a shanty choir director from Gorsel NL. I find A/D to be the best key for playing in but I have noticed that the G/C is fast becoming a standard instead of the C/F. Een nieuwe deun, maar hoe?